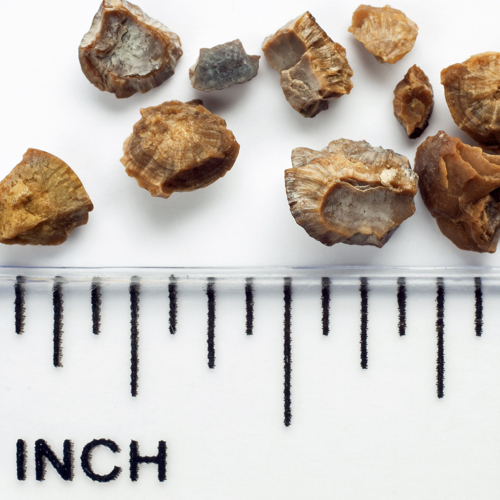 In the U.S., 1 in 11 people suffer from kidney stones. This represents an increase from 20 years ago, when the data showed 1 in 20 were afflicted. In 75% of cases, kidney stones are comprised of calcium. Uric acid stones are the second most common form. Animal protein has been associated with the development of kidney stones, by increasing acid load, which fosters the stone production. In contrast, fresh fruit, fiber, and magnesium have been associated with a decreased risk of stone production. Those who have formed stones can reduce future risk of stone development by significantly reducing consumption of animal protein. Eliminating the consumption of animal protein not only decreases acid production, but also decreases the excretion of urate, which can form uric acid crystals. High sodium intake has also been associated with an increased risk of kidney stones. Yeast is high in purines, which can raise one’s risk of uric acid stones. Because soluble oxalates can bind calcium and form insoluble calcium oxalate stones, foods high in oxalates are also associated with an increased risk of kidney stones. Such foods include starfruit; beets; and high doses of turmeric (the equivalent of 6-7 capsules of turmeric supplement per day). Although cinnamon is as high in oxalates as tumeric, less than 10% of its oxalates are soluble, so significantly less are absorbed. Recommendations to prevent kidney stones include drinking 10 to 12 cups of water per day, decreasing animal protein intake, decreasing sodium consumption, and adding more vegetables into the diet. Phytates, found in beans, grains, nuts, and seeds have also been shown to prevent kidney stone formation. Image Credit: piotr_malczyk / Thinkstock. This image has been modified.